The MAN A22 (NL323F) is a low-floor, wheelchair-accessible, single-deck transit bus chassis offered by MAN Truck & Bus. As part of the MAN NLxx3F line of bus chassis, units were sold to various operators around the world, particularly in Germany, Spain, Israel, Singapore and the UK, and built up by various bodywork companies. 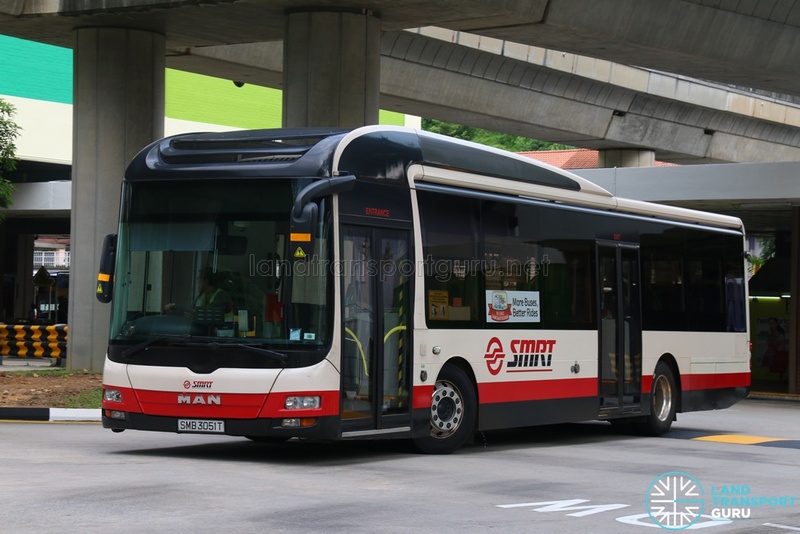 First introduced locally in 2010 by SMRT Buses, a successful trial unit led to a further purchase of 734 units (Euro V) in three batches, all built to SMRT specifications. Deliveries and registrations were completed in October 2016. 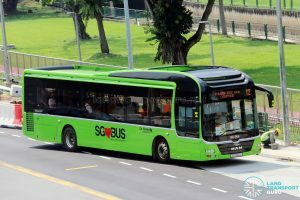 Under the Bus Contracting Model, MAN NL323F buses were also leased to Tower Transit, SBS Transit and Go-Ahead Singapore. 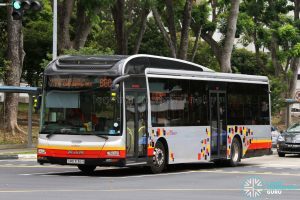 The Land Transport Authority (LTA) has also initiated purchases of Euro VI (Euro 6) MAN NL323F buses and MAN A95 Buses under Contract PT337 – Procurement of 250 MAN Buses. 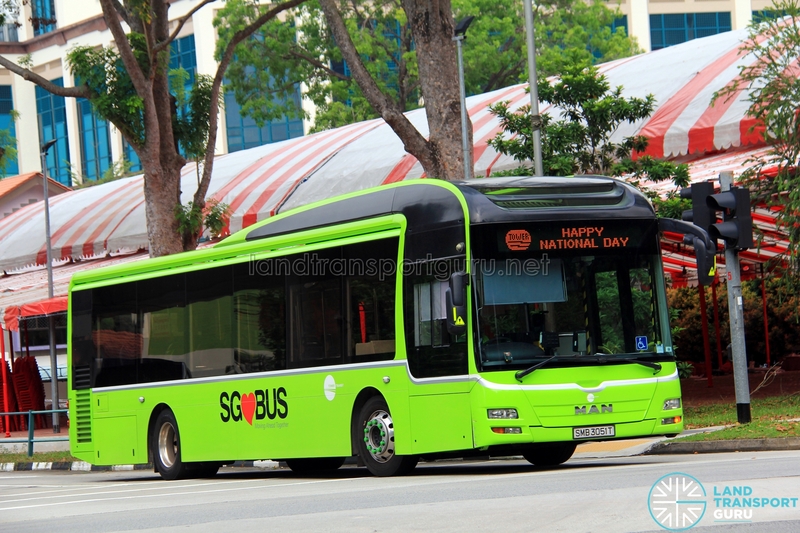 A one-off 3-door MAN Lion’s City SD Concept Bus formerly underwent trials with SMRT Buses. 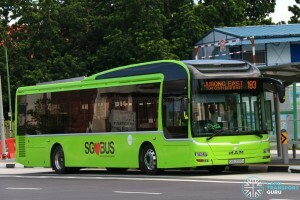 An existing MAN NL323F bus was also refitted to an electric bus. The MAN NL323F is part of the MAN NLxx3F line of bus chassis (coded A22), the ‘3’ referring to a third-generation rear-engined city bus chassis, It is based off MAN’s popular urban bus line, the Lion’s City, which is only available as an integral bodywork by MAN. The NL323F is available with various bodywork designs from different manufacturers. Diesel-powered MAN NLxx3Fs come with the standard MAN D2066 LUH inline 6-cylinder, horizontally-mounted, turbocharged & inter-cooled engine, with a range of available power outputs of between 270 and 400 horsepower over Euro III to Euro VI emission standards. The Euro V engine option (MAN D2066) has two-stage turbocharging with intercooling. It incorporates the MAN PURE DIESEL® Exhaust Gas Re-circulation (EGR) process and diesel oxidation catalytic converter system for emissions control. 320hp, 360hp and 400hp versions are available. The Euro VI engine option (MAN D2066) also has two-stage turbocharging with intercooling. It incorporates the MAN PURE DIESEL® EGR process with the MAN SCRT exhaust aftertreatment system. The MAN SCRT system consists of a Diesel particulate filter and an SCR particulate filter, hence requiring diesel exhaust fluids such as AdBlue. 280hp, 320hp, 360hp and 400hp versions are available. For transmission, the MAN NLxx3F offers a Voith 4-speed automatic transmission as standard, with an optional offering of a ZF EcoLife 6-speed automatic transmission. The integrated hydraulic retarder offers boosted operating economy, longer service life, and higher temperature resistance for operation with Euro V compatible engines. A portal axle is used for the rear wheels, and all wheels come with disc brakes. Similar to other MAN urban buses, the NL323F chassis are manufactured and assembled in Salzgitter, Germany. Hybrid-electric, compressed natural gas (CNG) and regular diesel powered variants of the MAN NLxx3F are available, all capable of meeting Euro-VI emission standards. 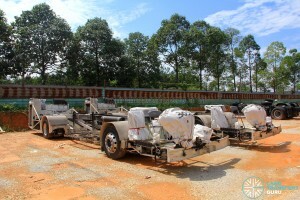 MAN bus chassis are manufactured in Germany and then shipped to Malaysia for body assembly. 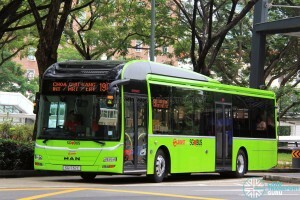 MAN NL323F buses are bodied by Gemilang Coachworks in Johor, Malaysia. Similar in appearance to MAN’s integral ‘Lion’s City Hybrid‘ in the European market, the design is built under license by Gemilang. The protruding roof structure, a defining feature of this model, conceals an air-conditioning pod which would have otherwise have been used for other components on the CNG, LNG and Hybrid models. 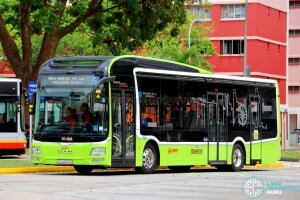 After complete assembly, inspection and testing, buses are driven from Gemilang’s assembly plant to Singapore. 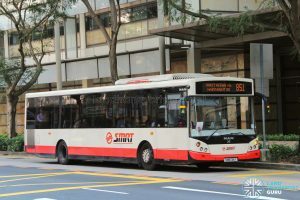 As SMRT’s fleet of Mercedes-Benz O405s fast approached retirement age, there was a need for a large replacement of 12-metre buses that were wheelchair-accessible and environmentally friendly. SMRT’s first MAN NL323F was a demonstrator unit, bodied by MCV (Manufacturing Commercial Vehicles) of Egypt, of the MCV Evolution bodywork. Registered as SMB138Y, it entered service in December 2010 and delivered satisfactory performance during its one-year trial period. It was also favoured over SMB136C (SMRT’s Citaro demonstrator) as a suitable bus for large-scale fleet renewal and expansion. SMB138Y was taken out of revenue service in 2012. 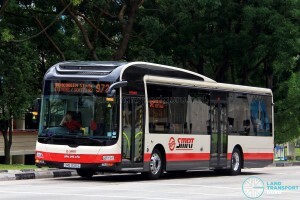 In 2013, SMRT announced purchases of 200 additional MAN NL323Fs, this time with a MAN Lion’s City Hybrid bodywork manufactured and assembled by Gemilang Coachworks. Later that year, another 202 units were ordered. A third batch announced in April 2014 were registered from July 2014 to Oct 2016. In 2018, a batch of Euro 6 MAN NL323Fs were delivered without an open tender for procurement of these buses. They are presumed to be purchased under a negotiated contract between ST Kinetics and LTA. – Exhaust Gas Re-circulation (EGR) technology and MAN’s own PM-Kat® exhaust treatment system, without the need for diesel exhaust fluids. MAN PURE DIESEL® Exhaust Gas Recirculation (EGR) process and MAN SCRT Selective Catalytic Reduction (SCR) exhaust after-treatment process, hence requiring diesel exhaust fluids such as AdBlue. 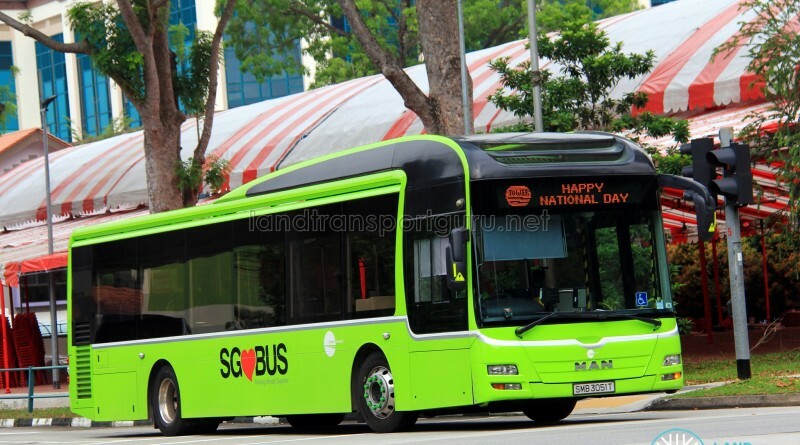 In 2010, SMRT Buses received a MAN NL323F demonstrator unit for road testing and evaluation by MAN’s local dealer, ST Kinetics. 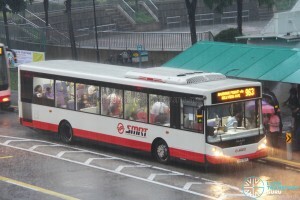 The bus was registered on 17 Dec 2010 as SMB138Y, the fifth demonstrator unit received by SMRT Buses. 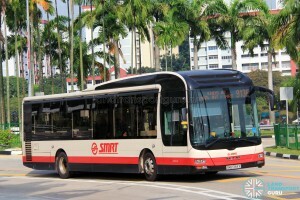 The bus underwent a year-long trial with SMRT Buses and was returned to the dealer after 2 years on the road. 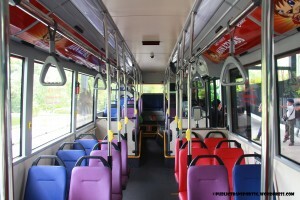 Inside, SMB138Y was fitted with the standard blue, purple and red Volgelsitze seats, the interior color scheme of choice for SMRT. Like the previously-introduced Citaro demonstrator (SMB136C), it has a single wheelchair lot equipped with a foldable seat for two people. The rear row of seats has just four seats, with extra space taken up by engine components. 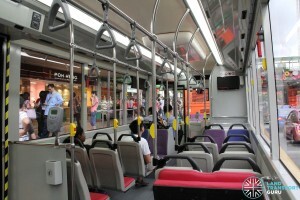 It the first SMRT bus to be equipped with a TV screen (from LG), which plays SMRT commercials. Free Wi-Fi access is also available. 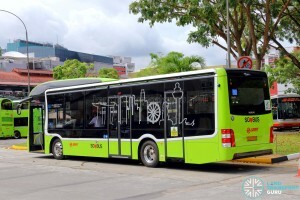 The rear exit doors of SMB138Y were sliding plug doors supplied by Ventura Systems (based in the Netherlands), a first for public buses in Singapore. The door is pushed out of the door frame before sliding open, unlike the existing swinging plug doors which can only swing outwards. The reduced outward swinging distance of the sliding plug design brings along additional safety, of not hitting people or objects at bus stops. The sliding plug design would be later incorporated in production batch MAN NL323Fs (from a different manufacturer), and the later Alexander Dennis Enviro500s would continue to use Ventura sliding plug doors. SMB138Y made its revenue service debut on 23 December 2010, appearing on SMRT Service 961 between Woodlands and Lorong 1 Geylang and was under the control of Woodlands Depot (WLDEP). 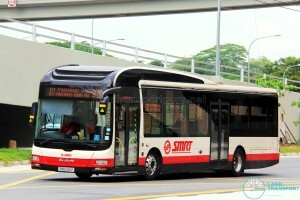 During its time on the roads, it was also the only SMRT bus to provide free onboard Wi-Fi. SMB138Y was later redeployed to Service 963, making occasional appearances on 169A, 962 and 963E, before being transferred to Ang Mo Kio Depot (AMDEP) and redeployed to Service 985. It had made special appearances on 61, 106, 167, 851, 857, 858, 858A, 960, 963R, 966 and 971E. The trial of SMB138Y was ultimately successful, with SMRT initiating further purchases of the MAN NL323F chassis of a different bodywork. Following water damage to its electronics in 2012, the bus was laid up for maintenance, and never saw revenue service again. In early 2013, the bus was returned ST Kinetics after two years on the road, concluding its trial period, and eventually deregistered in November 2014. 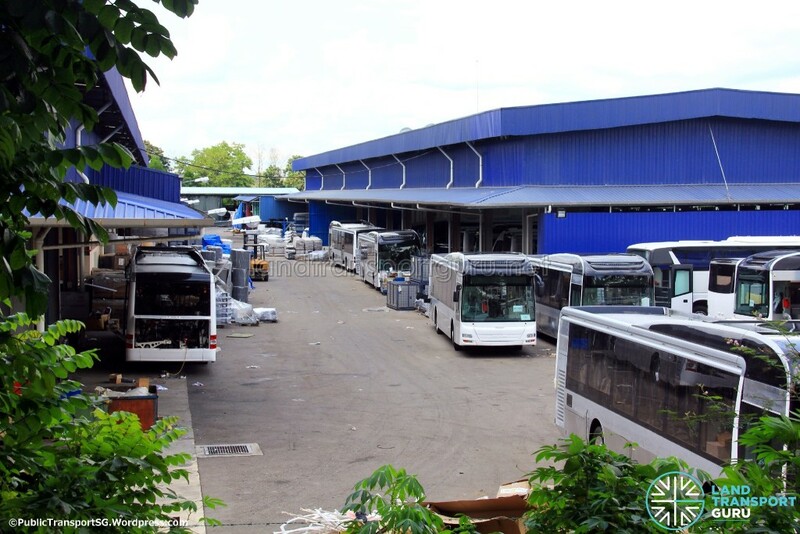 In March 2015, the bus was spotted undergoing refitting works at Gemilang Coachworks, where SMRT’s MAN A22, A24 and A95s are assembled. The re-bodied bus was displayed at the 2015 BusVic Maintenance Conference in Australia. The eventual fate of the bus was traced only in November 2015, when it was spotted in Sydney, Australia for Carbridge, an Australian bus company supporting airport operations. The bus was re-bodied with a MAN Lion’s City Hybrid bodywork, with a single leaf exit door. The bus now is currently registered as CVL 3187, with fleet number 88. Following the successful trial of SMB138Y, SMRT Buses placed orders for MAN NL323Fs as part of its fleet renewal programme, bodied by Gemilang of the Lion’s City Hybrid design. 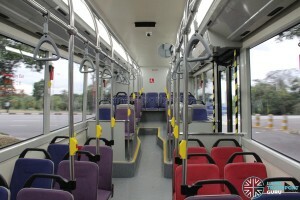 A total of 734 buses were purchased in 3 batches by SMRT Buses, all of which were of the Euro V specification. Exhaust Gas Re-circulation (EGR) technology and MAN’s own PM-Kat® exhaust treatment system, without the need for diesel exhaust fluids. 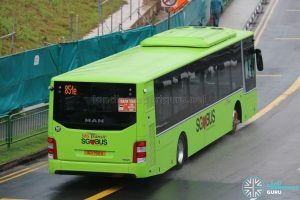 The first MAN NL323F (Production Batch) made its revenue service debut on 3rd October 2011, operating on Bus Service 963. 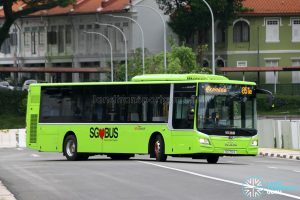 The bodywork used on these buses were similar to MAN’s Lion City Hybrid buses, but manufactured by Gemilang Coachworks of Malaysia, under license from MAN. Like other MAN buses, the chassis was built in Germany. 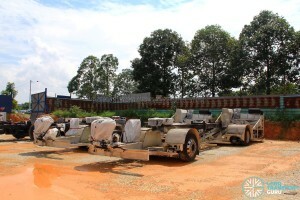 They were then assembled by Gemilang in Malaysia before final delivery to Singapore. One of the most distinguishing features of the production batch is the enlarged roof design, which in the original Lion’s City Hybrid, helps divert air to cool electrical components located on the roof. For the production batch of MAN NL323Fs, the roof is less useful and simply conceals the air-conditioning pod. 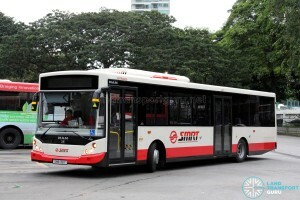 The first two buses were initially painted in SMRT’s White and Red livery. After the launch of SMRT’s new “pixel” livery in January 2014, the third batch of buses was mostly painted in the new livery. 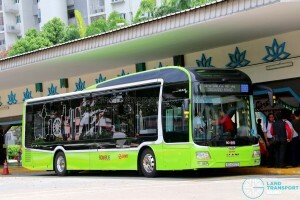 26 buses were painted in LTA’s Lush Green livery. 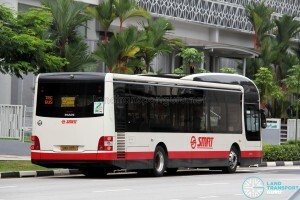 Later buses also featured a newer SMRT logo in full red, as opposed to the older red-black logo. 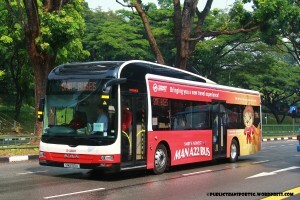 Batch 3 buses feature a slight engine cover design change, similar to MAN A24 and MAN A95 buses. 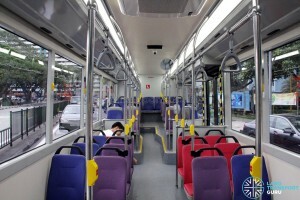 Buses are fitted with the standard blue, purple and red Volgelsitze seats, the interior colour scheme of choice for SMRT. 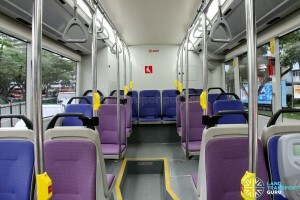 Similar to SMB138Y, it has a single wheelchair lot equipped with a foldable seat for two people. The rear row of seats has just four seats, with extra space taken up by engine components. The unique sliding plug door design was retained from the demonstrator unit, but with new doors supplied by Masats of Spain, featuring much faster opening and closing operation. A vocal “Doors Are Closing” chime, similar to those used on SMRT’s Trains, is played when the exit doors are being closed. The entrance doors are equipped with the same chime for Batch 3 buses only. Air-conditioning vents in the first two batches of buses are non-adjustable, spaced equally throughout the bus. Adjustable ball vents were made available in the third batch of buses. From the 2nd batch of buses onwards, two additional grab poles were installed at the front of the bus, and door movement markings pasted on the floor underneath the front door. The first 278 buses have a licensed carrying capacity of 90 passengers, comprising 38 seating and 52 standing passengers. The wheelchair bay accommodates a single wheelchair, and is equipped with a rear-facing foldable seat for two people when not occupied by a wheelchair user. Subsequent buses had 3 seats removed to create more standing area, and have licensed carrying capacity of 91 passengers, comprising 35 seating and 56 standing passengers. In 2013, 20 units of the MAN NL323F were registered with the Malaysian Land Transport Public Commission (Suruhanjaya Pengangkutan Awam Darat (SPAD)) for deployment on cross-border Bus Service 950, replacing the previous fleet of Mercedes-Benz O405 and Mercedes-Benz OC500LE buses. 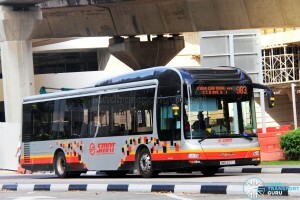 On 1st October 2011, SMRT organised a handover ceremony at Hort Park, featuring SMB189A and SMB191S. 2 days later (3rd October 2011), SMB189A made its debut on Service 963 and 963E. Originally equipped with an additional step before the rear row of seats, the step was subsequently removed. No other MAN A22 bus was fitted with the step. 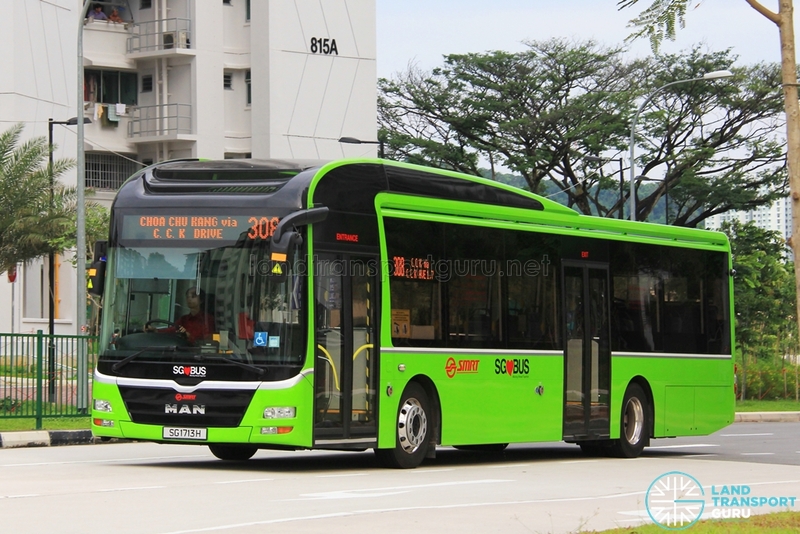 As part of the Bus Contracting Model, the Land Transport Authority (LTA) has initiated further purchases of MAN NL323F buses, as well as MAN A95 buses under Contract PT337 – Procurement of 250 MAN Buses. These buses are of the Euro VI specification and are bodied by Gemilang Coachworks with the MAN Lion’s City bodywork. In compliance with new LTA specifications, buses are equipped with Passenger Information Display Systems (PIDS) and two wheelchair bays. For background information on the BSEP, read the Bus Services Enhancement Programme article. 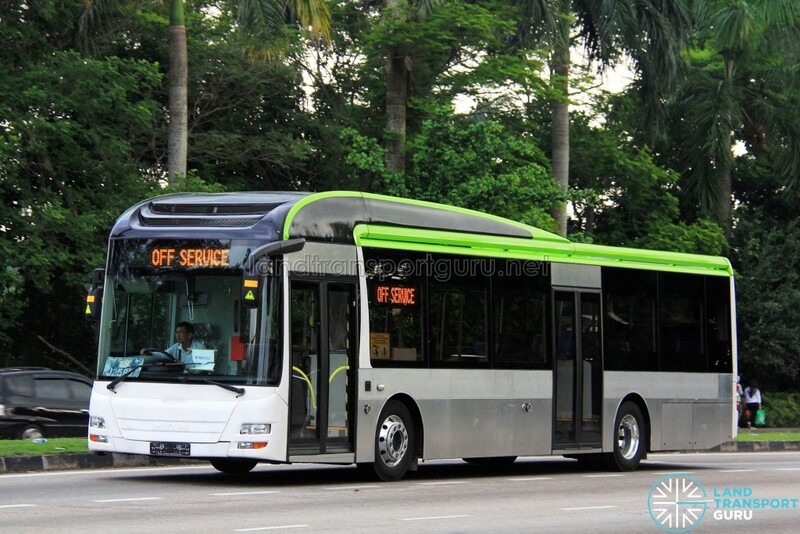 Before the Bus Contracting Model (BCM) was launched, the LTA had directly funded the purchase of buses under the Bus Service Enhancement Programme (BSEP) launched in 2012, where these resources were used to launch new bus routes and enhance existing ones. Whilst registrations for Batch 1, 2 and 3 MAN NL323F were ongoing, a portion of buses from each batch were diverted to the BSEP, where they were registered as SMB3001M – SMB3169M. Technical specifications of the BSEP-registered buses are identical to the Production batches that they were taken out from. Deliveries ended in early 2016 with the remainder of buses registered under the BCM instead. BSEP MAN NL323Fs were also the first buses to spearhead the transition to the BCM as these buses were owned by the Government. 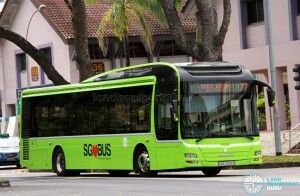 Some units were delivered with SMRT Buses’ new livery. Under the BSEP, these buses are subject to strict deployment regulations, such as being barred from commercial advertising, and deployment only on BSEP bus routes or enhanced bus routes under the BSEP scheme. 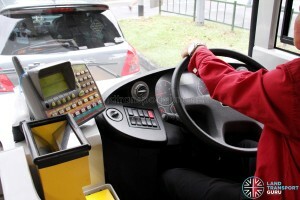 The LTA can track bus positioning, passenger loading statistics and other parameters in real time. For a more detailed guide, please refer to this article. 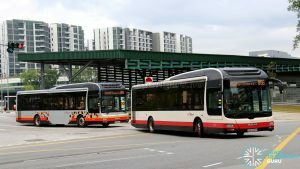 As part of the BCM, LTA would purchase buses from both SBS Transit and SMRT Buses to lease them to the winning transport operators of the various route packages. 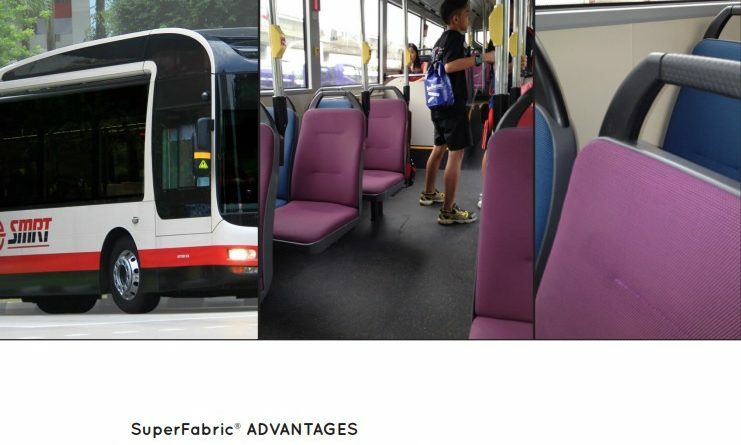 The bus models for this scheme include SBS Transit’s Mercedes-Benz Citaros, SBS Transit’s Volvo B9TL Wrights, SMRT’s MAN NL323Fs, SMRT’s Alexander Dennis Enviro500s as well as SMRT’s MAN A95s. 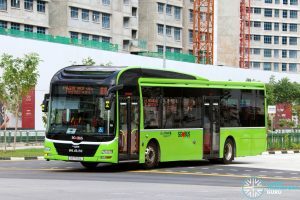 LTA has initiated the BCM initially by recalling buses initially registered under the Bus Service Enhancement Programme (BSEP). These buses, in service with SMRT but owned by the Government, were rerouted to operators of the first few BCM packages such as Tower Transit, the initial operator of the Bulim Bus Package. At the same time, the later Government-owned MAN NL323Fs were registered with the SG-prefix. Several have been painted in a Lush Green livery. Several MAN A22 Buses are also transferred to SBS Transit for the Seletar Bus Package. 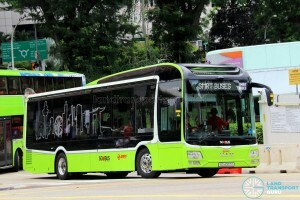 Singapore’s Land Transport Authority (LTA) previously evaluated a 3-door MAN Lion’s City SD Concept Bus. Bearing the registration plate SG4002G, the single-deck bus is entered revenue service trials on 19 June 2017, operated by SMRT Buses. The 12-metre long concept bus is built on a MAN NL323F (A22) low-entry chassis and features seats with headrests, a Passenger Information Display System, and a lower window line to allow passengers a better view of the surroundings. First showcased by MAN Truck & Bus at the LTA-UITP Singapore International Transport Congress and Exhibition (SITCE) in October 2016, the LTA had decided to trial this bus on revenue service to determine the suitability of 3-door single-deck buses in Singapore. SMB235A was previously fitted with SuperFabric seat covers for a period of time before being replaced with conventional seat covers. The trial was never announced, but was featured on promotional materials from SuperFabric. SMB222L was scrapped, and SMB3075A is now laid up? Yes there is a Euro VI A22 at STK with no lion head body..Front look same like the B3 A95 without fog lamps..
GAS should lease 10 SG A22 from SMRT/LTA and exchange with their 10 SG B9TL.